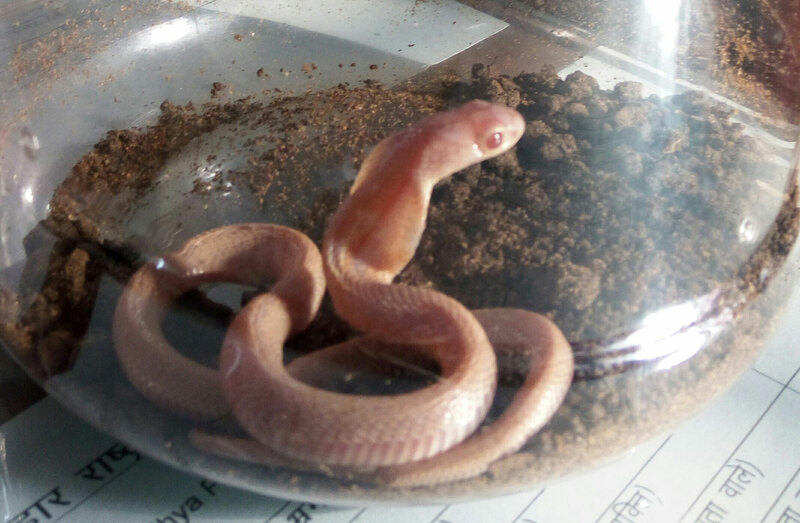 The White Cobra (Albino) rescued from Betul has been brought to Van Vihar Rashtriya Udyan. This astonishing and beautiful snake has been caught from Sarni region of Betul District. The nature has given black colour to Cobra but sometimes due to genetic modification albino creatures take birth. These kinds of creature do not live long and always fall prey to poachers due to their colour. The White Cobra has been kept under the supervision of doctor in the transit centre made for snakes in the VanVihar. The cobra is being watched constantly in the park after the health checkup. Defeating the Airpocalypse: 13 solutions for clean air assessed. With at least 550 million Indians, including 50 million children under 5, living in areas where air pollution levels exceed national standards, air pollution is a national health emergency. A new report by Louisiana State University researchers lays out 13 measures to reduce air pollution levels by 40% across India, avoiding 9 lakh premature deaths per year. In Delhi, wintertime PM2.5 levels would be reduced by 60% through these measures. Summary- As India prepares a National Clean Air Plan, information on the sources and the most effective solutions to the high air pollution levels plaguing the country is sorely needed. To address this need, Louisiana State University researchers have carried out an atmospheric modeling study1 that identifies ambient air pollution sources and analyses their contribution to pollution levels. The report assessed the air quality impacts of measures identified by Greenpeace India as having a high potential to address the emergency-level air pollution situation in India, targeting multiple sectors such as thermal power (operational, under-construction & new power plants), manufacturing industries, brickmaking, household solid fuels, transport, crop burning, municipal waste burning, construction and residential Diesel Generator sets use. The measures with the largest potential for air quality improvements are reducing emissions from thermal power plants, instituting strong emissions standards for industries, reducing solid fuel use in households, shifting to zig-zag kilns in brickmaking, and introducing stronger vehicular emissions standards in an accelerated schedule. Each of these measures could prevent 0.8 to 1.8 lakh deaths per year from air pollution by implementing the suggested measures. Implementation of all 13 measures is necessary for achieve the 40% reduction in air pollution levels at the national scale. The report evaluated policy measures addressing thermal power, manufacturing industries, brickmaking, household solid fuels, transport, crop burning, municipal waste burning, construction and DG sets. Based on the results of the modeling, residential sector, industry, agriculture and power sector are the sectors contributing the most to PM2.5 levels nationwide. While the residential sector is the largest contributor overall, implementing emission controls is most feasible in major point sources in power plants and industry. As a result, these sectors contribute half of the projected air quality improvements, while being responsible for one quarter of the current pollution levels. Contribution of vehicular emissions was the largest in Karnataka. Agriculture contributes the most in the northeast. Windblown dust is, predictably, a major contributor to PM2.5 levels in Gujarat and Rajasthan. Point sources' contribution exceeds one third in Delhi, Maharashtra, Chhattisgarh, Jharkhand and Tamil Nadu, and consequently these states would see the largest benefits from swift and full implementation of emissions standards in power plants and industry. The 13 policy measures assessed in the report will constitute a major step towards clean air in India. At the same time, in order to ensure safe air for all Indians, substantial further steps will be needed, as PM2.5 levels would remain at unsafe levels in much of the country even after their implementation. Accelerating clean energy and introducing further local policies in critically polluted cities will be key. The report is collaboration between atmospheric modeling specialists in Louisiana State University and Greenpeace researchers. The data and atmospheric simulations used for the research have been validated in a peer-reviewed article published in the journal Atmospheric Environment2 . State's first Butterfly Park dedicated in Raisen. 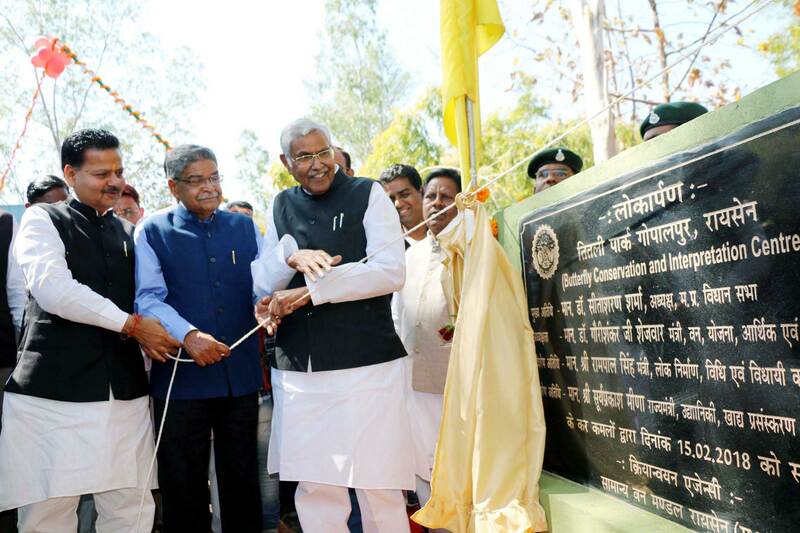 Vidhan Sabha Speaker Dr. Sitasaran Sharma today dedicated the state's first Butterfly Park at Gopalpur in Raisen. Public Works Minister Shri Rampal Singh was also present at the programme presided over Forest Minister Dr. Gaurishankar Shejwar. There are 65 species of butterflies in the park that is spread on three hectare area. Apart from a congenial atmosphere developed for breeding of butterflies, nearly 137 varieties of saplings have been planted in the park. A trekking track has been made for the people to view the butterflies. Dr. Sharma said that the Butterfly Park is an important initiative of the Froest Department in the conservation of nature. The park will not only provide a place for people and children to have proximity with nature but will also increase their general knowledge. Dr. Shejwar said that the park will give a new identity to the state in the field of eco tourism. He lauded officers and employees of eco-tourism board who played a significant role in the construction of the park. Dr. Shejwar said that arrangement has been made in the auditorium of the park to give detailed information to children about butterflies, wild animals and nature. Competitions connected with nature and environment will be organized in the auditorium. Trekking track will be adventurous for children. He said that a Machli Ghar is being planned at the park in future. Public Works Minister Shri Rampal Singh said that tourists visiting Raisen district will now be able to enjoy at the Butterfly Park along with the historic sites. He said that a survey of losses incurred due to hailstorm is being conducted. Affected farmers will be given all possible assistance. Chief Executive Officer of Eco-tourism Board Shri Pushkar Singh gave detailed information about the construction of Butterfly Park. The guests released a brochure based on the Butterfly Park. The brochure contains information of the species and life-cycle of butterflies. Vidhan Sabha Speaker Dr. Sharma, Forest Minister Dr. Shejwar and Public Works Minister Shri Singh gave away prizes to the winners of the painting contest organized by Forest Department and Butterfly expert Shri Saran Mahatre. 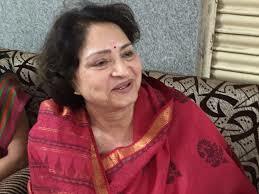 District Panchayat President Smt. Anita Kirar, Sanchi Janpad President Shri S. Munian, Additional Chief Secretary Shri Deepak Khandekar, Chief Conservator of Forests Shri Animesh Shukla, Principal Chief Conservator of Forests (Wild Animals) Shri Jitendra Agrawal, Managing Director of Forest Development Corporation Shri Ravi Shrivastava besides officers/employees of the Forest Department were present on the occasion. Surprise inspection by Principal Secretary, Environment Shri Anupam Rajan at Bhanpur trenching ground. 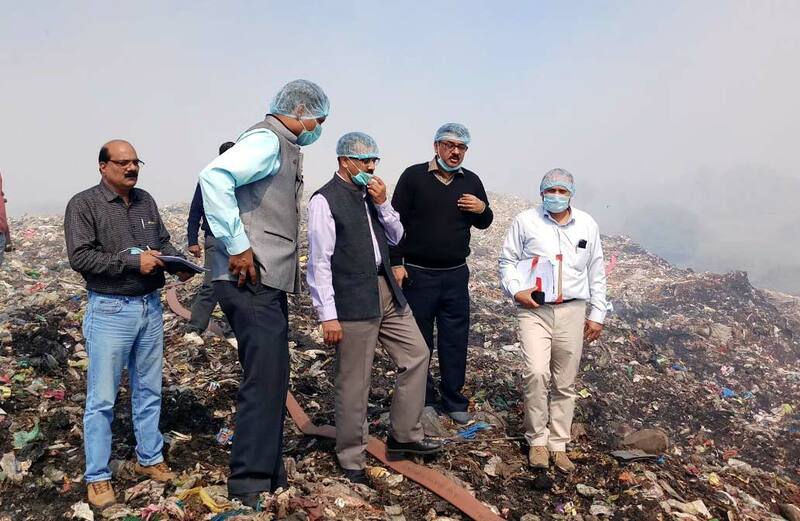 Principal Secretary, Environment and Chairman of Pollution Control Board Shri Anupam Rajan on Wednesday conducted surprise check at Bhanpur trenching ground with staff on the complaint of sudden fire broke out there and air pollution. Shri Rajan issued instructions to install wire fencing or boundary wall around the landfill site and cameras for continuous monitoring at the spot. Shri Rajan asked fire brigade staff to pour water constantly on the site, taking immediate action. A show cause notice has been issued to commissioner, muncipal corporation, by Regional officer, Madhya Pradesh Pollution Control Board regarding the incident. Member secretary of the board Shri AA Mishra, regional officer Dr PS Bundela, health officer of municipal corporation Shri Rakesh Sharma and other officers-employees were present with Shri Rajan, on the complaint of fire and air pollution at the spot. Minister Smt. Singh Urges Center to give Rs. 39 Crore for Closure of Bhanpur Dumping Ground. Bhopal, 15 th September, 2017: The United Nations General Assembly on 23 rd January, 1995 adopted resolution 49/114, which proclaims 16 th September, 2017 as the World Ozone Day, commemorating the date on which Montreal Protocol was signed in 1987. The protocol was ratified by all 197 member countries of United Nations and has so far been successful in phasing out around 98% of ozone depleting substances (ODSs). This World Zone Day offers an opportunity to focus global attention and action on this vital environmental issue. This year's World Ozone Day marks the 30 th anniversary of the Montreal Protocol on substances that deplete ozone layer and all its amendments. Besides, India being a party to the Vienna Convention for the protection of Ozone Layer, has been successfully implementing the phase-out program for ozone depleting substances (ODSs) in the country. The theme for the celebration of this year's World Ozone Day is "Caring for all life under the sun". The Regional Office (Western Zone) of Ministry of Environment, Forests and Climate Change at Bhopal is celebrating 'World Ozone Day' on 16 th September, 2017. The event is being organized in collaboration and partnership with other sub-ordinate bodies of this Ministry, i.e., Indian Institute of Forest Management, Bhopal, Central Pollution Control Board, Regional Directorate Bhopal and Regional museum of Natural History, Bhopal. To promote and spread awareness among the general public on the measures to be taken for phasing out of ODSs, a number of events/competitions are being organized during 15 th & 16 th September, 2017 for participants from different backgrounds i.e., school level, college level and industry -level. Various competitions like Painting, Debate, Scientific model making, etc have been organized on the Day 1 of the programme (i.e., 15 th September, 2017) for the school level students to encourage and promote awareness on the importance of ozone layer and its protection. Students from 6 reputed schools namely, Carmel, Campion, Sanskar Valley, Army Public School, Mother Teresa Convent, St. Joseph Co-ed School have participated in the day long events on 15 th September, 2017. Scientific models have also been displayed by the school students to promote awareness on Environment Protection. Simultaneously, students from various reputed educational institutes like MANIT, IIFM, etc. have also took part in the debate and slogan writing competitions held as part of this programme. Tomorrow i.e., 16 th September, 2017 quiz competition will be held for the school level students. Ministry has extended invitations to a number of Schools in this regard. In the afternoon, around 50 major industrial units (both public sector as well as private sector) from across Madhya Pradesh and Gujarat will be participating in the industrial interaction and Poster Competition to be held on 16 th September, 2017 (2.00 PM onwards). Winners of individual events will be awarded certificates and Prizes during the valedictory function to be held at IIFM Bhopal on 16 th Sept. 2017 at 5.30 PM. In addition, many schools will organize painting and slogan writing competitions all over the country and the best entry from each school will be forwarded to State Nodal Agency under National Green Corps of this Ministry in the state concerned (for eg. EPCO in MP). Winners of different categories in each state/Union Territory will be awarded cash prizes by this Ministry based on the recommendations of an expert panel constituted under the chairmanship of Addl. Principal Chief Conservator of Forests (Central) of this Regional Office. The participating students will become the "Ozone Hero's" for spreading the awareness on Ozone Layer Protection and its associated environmental benefits. Globally, a paradigm shift in the approach to disaster management, from relief andrehabilitation to prevention and mitigation within a holistic and comprehensive framework, occurredin the decade of the 1990s, which was observed as the International Decade for Natural DisasterReduction (IDNDR) by the United Nations Organization. In 1994, the Yokohama Strategy and Planof Action for a Safer World was adopted at the World Conference on Natural Disasters. In 1999, aUnited Nations General Assembly Resolution adopted the International Strategy for DisasterReduction (ISDR) and created the Secretariat of the ISDR (UNISDR) with the objective of ensuringits implementation. In 2003 and 2004, the UNISDR carried out a review of the YokohamaDeclaration. This review formed the basis for the Hyogo Framework for Action 2005-2015: Buildingthe Resilience of Nations and Communities to Disasters (HFA) which was adopted by the WorldConference on Disaster Reduction held in 2005 and subsequently endorsed by the UN GeneralAssembly. Historically, measures to address problems of famine and to some extent floods havebeen the focus of disaster management in India. Some form of legal framework was introducedduring the late 1870s when the first Famine Commission suggested the formulation of FamineCodes. The 19th century witnessed the setting up of several Famine Commissions which developedFamine Codes. Even after Independence, disaster management efforts were limited to fightingnatural calamities, particularly severe droughts resulting in famines or famine-like conditions. Insome areas measures to mitigate the effects of excess rains and floods were taken. States had theirRelief Manuals containing norms and guidelines for such relief measures. Disasters can take many different forms, and the duration can range from an hourlydisruption to days or weeks of ongoing destruction. The main types of disasters are natural and man-made or technological in nature that can have a deep impact on community. Cyclones and tropicalstorms are among the most powerful natural disasters because of their size and destructive potential.Flooding is the most common of natural hazards, and requires an understanding of the naturalsystems of our environment, including floodplains and the frequency of flooding events. Wildfiresare more prevalent in the event of a drought. Disasters impacting food supply can be extremelycostly. Natural hazards are naturally occurring physical phenomena caused either by rapid or slowonset events which can be geophysical � earthquakes, landslides, tsunamis and volcanic activity,hydrological � avalanches and floods, climatological � extreme temperatures, drought and wildfires,meteorological � cyclones and storms/wave surges or biological � disease epidemics andinsect/animal plagues. Disasters also can be caused by humans. Hazardous materials emergencies include chemicalspills and groundwater contamination. Workplace fires are more common and can cause significantproperty damage and loss of life. Communities are also vulnerable to threats posed by extremistgroups who use violence against both people and property. High-risk targets include military andcivilian government facilities, international airports, large cities and high-profile landmarks. Cyber-terrorism involves attacks against computers and networks done to intimidate or coerce agovernment and its people for political and social objectives. Technological or man-made hazards �complex emergencies/conflicts, famine, displaced populations, industrial accidents and transportaccidents are events that are caused by humans and occur in or close to human settlements. This caninclude environmental degradation, pollution and accidents. There are a range of challenges, such asclimate change, unplanned-urbanization, under-development, poverty as well as the threat ofpandemics, that will shape humanitarian assistance in the future. These aggravating factors willresult in increased frequency, complexity and severity of disasters. Training Programme on Green Existing Building Rating System on 23rd December 2014 at Gurgaon. A green existing building is one which uses less water, optimizes energy efficiency, generates less waste and most importantly enhances occupant health, happiness & well-being, as compared to a conventional building. Considering the tremendous benefits that it offers, green building concept is gaining major importance in India. Indian Green Building Council�s (IGBC) rating systems launched since 2007 had made rapid strides in the Green Building sector. These rating systems have been successfully applied in India in as many as 2,850 new & existing buildings, till date with a footprint of 2.60 Billion sq.ft. Many Government, corporate, builders & developers in India have taken lead in constructing Green Buildings. With the growing demand for Green Buildings, there is a need to enhance the knowledge of building professionals on Green Building concepts & equip them on the Green Building rating Systems. In this context, IGBC is organising a one-day Training Programme on Green Existing Building Rating System on 23rd December 2014 at Gurgaon. Till date, IGBC has conducted several Green Building Training programme across India and trained nearly 20,000 professionals on green building concepts. The main objective of this training programme is to impart knowledge on Green Building concepts, facilitate building owners & facility managers in implementation of green strategies and share best O&M practices in Green Existing Buildings. You are requested to take advantage of this unique training program and nominate suitable delegates from your organization at the earliest. To ensure a highly interactive programme, the number of participants is restricted and the selection will be on a first-come-first basis. Land and water management resources are the need of the hour. While addressing the workshop on �Studying the Rural� at IIFM in Bhopal today the Union Minister of State (IC) for Information and Broadcasting, Environment & Forest and Parliamentary Affairs, Mr. Prakash Javedkar said that changes and new perspectives are required for environmental protection. The Union minister said that the implementation of watershed management projects resulted in providing water facilities for irrigation and benefitted the farmers. New crops, new patterns and new technology like internet reduced the middle man interference to MARKETING agriculture produce. The Minister expressed the concern about the excessive use of fertilizers and pesticides which resulted in contaminating the water. In the backdrop of climatic change there is a need for increasing forest cover for environmental protection. Speaking on the occasion Dr. Giridhar Kinhal, Director of IIFM said that IIFM is a pioneer in forest management education and research. The three day workshop is jointly organised by Indian Institute of Forest Management and Network of Rural and Agrarian Studies (NRAS). Our earth is indubitably warming. Even though the factors influencing the Global Climatic conditions are not thoroughly understood, there is increasing conviction across the global scientific community that the climate is changing. Hurricane Katrina, shrinking polar icecaps, receding glaciers of Greenland or the Himalayas, stronger tropical storms are event, which may not be absolutely unrelated or disintegrated but part of a poorly understood global phenomenon called �Climate Change and Ozone layer depletion.� Ozone, a tri-atomic molecule of oxygen is formed from oxygen naturally in the upper levels of the earth�s atmosphere by high-energy Ultraviolet (UV) radiation from the sun. About 90 per cent of ozone formed in this way lies between 10 and 50 kilometer above the earth�s surface- stratosphere. The stratospheric ozone layer absorbs all the harmful UV-B radiations emanating from the sun. It protects plant and animal life from UV-B radiation. The UV-B radiation has the potential to cause skin cancer, eye cataract, suppress body�s immune system, decrease crop yield etc., which led to the adoption of the Vienna Convention for the Protection of the Ozone Layer in 1985 and the Montreal Protocol on Substances that Deplete the Ozone Layer in 1987. Prevention of ozone layer depletion and protection of environment is the need of the hour for sustainable development. India was mainly producing and using nine of the 96 Ozone Depleting Substances (ODSs), controlled under the Montreal Protocol. These are chlorofluorocarbons (CFCs) viz., CFC-II, CFC-12, CFC-113; carbon tetrachloride (CTC) Hydrochlorofluorocarbon-22 (HCFC-22) halon-1211, halon-1301, methyl chloroform and methyl bromide. The Ministry has set up the Ozone Cell as a National Ozone Unit to render necessary services for effective and time implementation of the Protocol and its OFS phase-out programme. The Ministry of Environment and Forest has also established an Empowered steering Committee which is responsible for implementation of the Montreal Protocol provisions, review of various policies and implementation options, project approval and monitoring. Global warming is caused by an increase in the temperature of the Earth�s lower atmosphere. Global warming may lead to climate changes resulting from alterations to regional climatic events such as rainfall patterns, evaporation and preventive measures. Climate induced natural disasters (CINDs) like drought; flood and cyclones become serious problems to coastal areas. CINDs are of regular occurrence particularly in coastal areas of India and have become the part of normal life. The changes in climate due to global warming, lead to induce the chances of different types of natural disasters such as Drought, Floods, Cyclones and Forest fire and manmade disasters like Ozone depletion and Environmental acidification etc. Inter Governmental Panel and Climate Change (IPCC) of United Nations in its report has confirmed the global warming trend and projected that the globally averaged temperature of the air above earth�s surface would rise by 1.4 to 5.8 Celsius over the next 100 years. In developing countries like India, climate change could represent an additional stress on ecological and socio-economic systems that are already facing tremendous pressures due to rapid urbanization, industrialization and economic development. Taking projected emissions of greenhouse gases and sulphate aerosols into account, it predicts an increase in annual mean maximum and minimum surface air temperatures of 0.7 degree Celsius and 1.0 degree Celsius over land in the 2040s with respect to the 1980s. Human society will face new risks and pressures. Some regions are likely to experience food shortages and hunger. Water resources will be affected as precipitation and evaporation patterns change around the world. Economic activities, human settlements, and human health will experience many direct and indirect impacts of climate change. Every year, 16th September is observed as �International Day for the Preservation of Ozone Layer�. UNEP (United Nations Environment Programme) decided through a resolution adopted by the United Nations General Assembly in 1994 to observe this day to make people aware of issues related to depletion of Ozone layer and its destructive influence. The theme for this year is �Ozone Layer Protection: The Mission Goes On�. Climate change, as a phenomenon caused by historical concentration of greenhouse gases in the atmosphere over a period of time, is a cause of concern to the entire global community. Its effect on developing countries is particularly adverse as their capacity and resources to deal with the challenge is limited. Studies indicate that climate change may exacerbate the problem of existing climate variability in India. It is projected that, by the end of 21st century, rainfall in India may increase by 15-40% with high regional variability. Warming may be more pronounced over land areas with northern India experiencing maximum increase. The warming could be relatively greater in winter and post-monsoon seasons. The annual mean temperature could increase by 3�C to 6�C over the century. India�s emissions are estimated to be of the order of 1331.6 million tonnes of the carbon dioxide equivalent Green House Gas (GHG) emissions in 2007. The emissions indicate an annual growth of 4.2% from the levels in 1994. However, India�s CO2 emissions are only about 4% of total global CO2 emissions and much less if the historical concentrations are taken into account. Still, India has been conscious of the global challenge of climate change and its likely adverse impact on various sectors and ecosystems. Global Warming and Climate Change due to Green House Gases results in depletion of ozone layer. Rising levels of green house gases together with sulphur dioxide (SO2) and suspended particulate matters such as dust, etc. in the environment of our living planet earth are expected to cause climate change. By absorbing infrared radiation, these gases control the flow of natural energy through the climate system. Among the Green House Gases, Carbon dioxide (CO2) is currently responsible for over 60 percent of the �enhanced �Green House Effect, which is responsible for climate change. Biological activities of life on planet earth are absolutely solar power reliant. Carbon dioxide plays a critical role in trapping solar radiation inside the earth's atmosphere to elevate atmospheric temperature; the phenomenon is well known greenhouse effect. Some natural and anthropogenic gases entrap infra-red radiation and consequently lift up atmospheric temperature. Apart from CO2, gases like methane, chlorofluorocarbons, nitrous oxide, sulfur hexafluoride, hydroflourocarbons, water vapor, nitrous oxide, sulfur hexafluoride and hydroflourocarbon are responsible for the greenhouse effect. The greenhouse effect is completely a natural phenomenon, but unfortunately it is anthropogenically enhanced. The natural greenhouse effect is essential for existence of life of earth, without it the average global temperature would be-180C, a thermal pont that is far below the level of biological sustainability. Nevertheless, adverse anthropogenic activities help augment the atmospheric concentrations of greenhouse gases, impede with the natural greenhouse effect leading to the enhanced greenhouse effect thereby altering the atmospheric and sea surface temperature around the globe, which cause devastating climatic changes and environmental catastrophes. The vast majority of scientists believe that rising concentrations of �Green House Gases� (GHGs) in the Earth�s atmosphere, resulting from economic and demographic growth over the past two centuries since industrial revolution, are overriding this natural variability and leading to potentially irreversible climate change. Green House Gases (GHGs) especially Carbon Dioxide act like a blanket over Earth�s surface, keeping it warmer than it would otherwise be. Pre- industrial levels of Carbon dioxide were about 280 parts per million by volume and current levels are about 370 ppmv. The impact of climate change and global warming has been disastorous leading to rise in average global temperature, which is expected to go up by 1 to 4 degree Celsius in next 100 years. With its impact being felt across the globe, the concept of green is slowly gaining momentum in order to emit lesser GHG, particularly CO2. Mitigation strategies are required to adapt climate change in view of Kyoto Protocol, formation of Inter Governmental Panel on Climate Change (IPCC), UNFCCC and Indian initiatives like National Action Plans and eight nation missions to adopt climate change and for protection of environment. Ozone depletion describes two distinct but related phenomena observed since the late 1970s: a steady decline of about 4% per decade in the total volume of ozone in Earth's stratosphere the ozone layer, and a much larger springtime decrease in stratospheric ozone over Earth's polar regions. The latter phenomenon is referred to as the ozone hole. Chlorofluorocarbons (CFCs), chemicals found mainly in spray aerosols heavily used by industrialized nations for much of the past 50 years, are the primary culprits in ozone layer breakdown. When CFCs reach the upper atmosphere, they are exposed to ultraviolet rays, which causes them to break down into substances that include chlorine. The chlorine reacts with the oxygen atoms in ozone and rips apart the ozone molecule. Ozone Depleting Substances are those which destroy ozone molecules. These are all human-made. CFCs are powerful ozone destroyers. After being generated on earth by our activities, CFCs rise slowly into the stratosphere. Here, under the influence of high-energy ultraviolet (UV) radiation, they break down and release chlorine atoms, which speed up the breakdown of ozone molecule (O3) into oxygen molecule (O2) and oxygen atom (O). One CFC molecule can break down 100000 Ozone molecules through a catalytic chain reaction. Each time a polystyrene cup is thrown away, it eventually adds over 1 billion CFC molecules to the stratosphere- this can destroy up to 100 trillion molecules of ozone. CFCs do not destroy the ozone layer directly, but they act as carries for the chlorine to the upper atmosphere. Halons are similar to CFCs in structure but contain bromine atoms instead of chlorine. They are more dangerous to ozone than CFCs. Halons are used as fire extinguishing agents. Each bromine atom destroys hundreds of times more ozone molecules than does a chlorine atom. Carbon tetrachloride used as cleaning solvent for clothes and metals and also used in products such as correction fluid, dry cleaning sprays, spray adhesives, fire extinguishers, etc, is another ozone depleting substances. Ozone is a naturally occurring gas found in very small traces in the earth�s atmosphere. The earth�s ozone is found in two areas. Ozone molecules make up a very sparse layer in the upper atmosphere (stratosphere) which is about 17-48 km above the earth�s surface. This is called the Ozone Layer. The stratosphere contains about 90 per cent of all the ozone in the atmosphere. Some ozone is also found in the lower atmosphere (troposphere). The presence of ozone can be a good or a bad thing depending on where it is present. In the stratosphere, ozone acts as a harmful pollutant and sometimes causes photochemical smog. More than a trace of this gas in the troposphere can damage human lungs and tissues, and also harm plants. Ozone is also a greenhouse gas and contributes to greenhouse effect and therefore plays a role in climate. The mean total ozone amount in the atmosphere varies geographically and seasonally. It increases towards the poles in both hemispheres, while it is lesser towards the equator. The amount of ozone in the atmosphere is naturally fluctuating by small amounts all the time. It is affected by the seasons, changing wind patterns and other natural factors. For billions of years, a delicate balance has been maintained by nature. However, today, many human activities are harming the ozone layer and are leading to a decrease in the ozone levels in the upper atmosphere. The reduction in the amount of ozone in the upper atmosphere is known as Ozone Depletion. The chemicals causing this are called Ozone Depleting Substances. Depletion of the ozone layer allows potentially dangerous ultraviolet rays into the lower atmosphere. Our health would suffer due to the excess of UV radiation on earth. It can weaken our immune systems and make us more prone to disease. Exposure to UV radiation causes skin cancers and damages our eyes. The effects of ozone depletion will be felt globally, though some parts of the earth may be more severely affected than others. Countries like Australia, New Zealand, South Africa and parts of South America, where the ozone layer is depleted, are at greater risk than the rest of the world. It may increase the rate of skin cancer and cause the skin to freckle and age faster. It will increase the frequency of cataracts and other eye diseases in humans and animals. The ability of the human system to fight diseases (immune system) will also be weakened. Increases UV radiation affects plants by reducing leaf size and increasing germination time. This could decrease crop yield of corn, rice, soyabeans, peas, sorghum and wheat. There may be reduction in the growth of microscopic phytoplankton when UV radiation penetrates deep below the surface of oceans. These tiny, floating producers form the base of ocean food chains and food webs, and help remove CO2 from the atmosphere. Increased UV radiation damages paints and fabrics, causing them to fade faster, Plastic furniture, pipes, etc., exposed to the sun, also deteriorate faster. Natural disasters are an important cause for the loss of land in the coastal region of our country. The deltaic regions of West Bengal, Orissa and Andhra Pradesh are especially vulnerable to cyclones and the storm surges associated with them. Global warming is expected to result in the global sea level rise affecting various marine habitats in the low-lying areas. The mangroves being more vulnerable are constantly under threat from increasing anthropogenic pressures such as indiscriminate cutting, reclamation mainly for agriculture and urbanization, fuel and construction and overgrazing by domestic cattle as well as from sea level rise. Such global climatic changes will affect agriculture through their direct and indirect effects on Kharif and Rabi crops, soils, livestock and pests. Increase in atmospheric carbon dioxide has a fertilization effect on crops resulted into their growth and productivity. Increase in temperature can reduce crop duration; increase crop respiration rates alter photosynthate, affect the survival and distributions of pest populations thus developing new equilibrium between crops and pests. A changing climate is likely to affect all these conditions and hence have a powerful impact on human health and well being. Climate Change can affect human health like stress, death, injury in floods and storms and indirectly through changes in the ranges of disease vectors, waterborne pathogens, water quality, air quality and food availability and quality. Climate change leads to extremes and violent weathers events, resurgence of disease organism an vectors; affects the quality of air, food and water and the stability of the ecosystem on which we depend. Human activities, such as transportation, logging, construction, extensive agriculture, and environmental pollution have destroyed wildlife habitat severely. Habitat loss is a major cause of the reduction of wildlife species. Climate change is expected to trigger more turmoil to habitat conditions. Animals will have to choose permanent relocation from their current habitats and plant community will have to colonize new areas, where the climatic conditions are appropriate for their life needs. The Vienna Convention for the protection of the Ozone Layer and its Montreal Protocol on substances that deplete the Ozone Layer. The Vienna Convention for the Protection of the Ozone Layer and its Montreal Protocol on Substances that Deplete the Ozone Layer are the specific and dedicated International Treaties for the protection of the Earth�s Ozone Layer. Montreal Protocol has been recognized as the most successful International Environmental Treaty in history. It has received Universal Ratification from all the 197 Parties of the World. In the 25 years of its operation, extraordinary international cooperation under this agreement has led to phase-out of production and consumption of several major ODSs such as Chloro fluoro Carbons (CFCs), Carbon Tetrachloride (CTC) and halons globally by 1st January, 2010. This amounts to phase-out of 98% of the Ozone Depletion weighted level of the global production and consumption of all the chemicals controlled by the Montreal Protocol. It has not only protected the stratospheric ozone but it has also immensely benefitted the climate system. As per experts estimates, the Montreal Protocol has reduced Green House Gas (GHG) emissions by 11 gigatonnes Carbon Dioxide (CO2) equivalent per year through its ODS phase-out activities. A Roadmap for phasing-out of HCFCs was developed describing the long term vision and action plan including the policy instruments for phasing out of production and consumption of HCFCs in India. Awareness activities at the national and state levels were organized to sensitize the stakeholders to phase-out the ODS in various sectors. The International Day for the Preservation of the Ozone Layer is being organized every year in the country on 16th September, at national and state levels since 1995. IPCC is a specialized body jointly established by the United Nations Environment Programme (UNEP) and World Meteorological Organization mandated to prepare scientific assessments on various aspects of climate change. IPCC is currently engaged in the preparation of Fifth Assessment Report on Climate Change through three Working Groups. India is engaged with the IPCC in analyzing and critically examining the work being done under 3 Working Groups of the IPCC in phased manner. Working Group I on the Climate Change will present the physical science basis and is expected to release its full report and Summary for Policymakers in September 2013. Working Group II on climate change impacts, adaptation and vulnerability is expected to release its full report and Summary for Policymakers in March 2014. Working Group III on assessment for mitigation of climate change will release its report and Summary for Policymakers in April 2014. The Synthesis Report comprising of key findings emerging from the three Working Groups of 5th Assessment Report and will be published by IPCC in October 2014. India�s domestic strategy for addressing climate change is reflected in many of its social and economic development programmes. The National Action Plan on Climate Change (NAPCC) coordinated by the Ministry of Environment & Forests is being implemented through the Nodal Ministries in specific sectors/areas. Eight national missions in the area of solar energy, enhanced energy efficiency, sustainable agriculture, sustainable habitat, water, Himalayan eco-system, increasing the forest cover and strategic knowledge for climate change form the core of National Action Plan. All national missions have been approved by the Prime Minister�s Council on Climate Change and are at different stages of implementation. Under advice of the Central Government, State Governments are also preparing State Action Plans on Climate Change that are aimed at creating institutional capacities and implementing sectoral activities to address climate change. The Ministry has set up the Ozone Cell as a National Ozone Unit to render necessary services for effective and timely implementation of the Protocol and its ODS phase-out program in India. The Ministry has also established an Empowered Steering Committee (ESC) Chaired by the Secretary (E&F) which is supported by two Standing Committees viz. Technology and Finance Standing Committee (TFSC) and Standing Committee on Monitoring. The ESC is overall responsible for implementation of the Montreal Protocol provisions, review of various policies and implementation options, project approval and monitoring. India is concerned about the ozone problem and has signed the Montreal Protocol in 1922. Strict measures have been taken in the country to phase out Ozone Depleting Substances. These measures include ban of trade in ODS, licensing import and export of ODS, and ban on creation of new ODS production facilities. It is industrialized countries which produce and consume a major amount of CFCs. Developing counties like India consume very little. For instance, per capita consumption of CFCs in India is 0.01 kg per year, while in the US it is about 50 times more. We are therefore not contributing very much to ODS pollution. Further, in a hot country like India, refrigeration and air conditioning are often a necessity. e.g. for preservation of foods, medicines, vaccines etc. In spite of all this, recognizing that ozone depletion is a global problem and that it needs to be solved through co-operation, India has signed the Montreal Protocol. India has always maintained that such agreements must be fair and equitable to all parties. For instance, developing countries are not in a position to invest too much money in research to find ozone-friendly substitutes. Nor can they change technologies and processes without suffering financial losses. Therefore these countries will not be in a position to change over to alternative substances, technologies and processes unless there is financial and technical support. The ministry of Environment and Forest had set up the Ozone Cell for taking initiatives for protection of ozone layer and implementation of UN Montreal Protocol. The cell is responsibile for carrying out all tasks relating to phaseout. It governs day-to-day operations, promulgation of relevant policies and monitoring implementation of all phaseout projects. The Ozone Cell reports to the Secretary, MoEF on key issues relating to Ozone Depleting Substances (ODS) phaseout and to the Executive Committee on the overall progress of all MLF-funded activities. The Quota and Licensing system, on CFC production, imports and exports of ODS, is primarily handled by Ozone Cell. The Ozone Cell receives MLF support for its operations through the United Nations Development Programme. It is the main interface between Central Government, Montreal Protocol Secretariat and ODS consuming industries in India. A Technology and Finance Standing Committee (TFSC) guides the development of policies. The TFSC reviews and approves all project-based activities to be undertaken. It is constituted by representatives from relevant ministries, national research institutions and industry associations. In addition to this, Monitoring Sub-Committee reviews production and consumption data and approves data for reporting the Ozone Secretariat. Representative of small and tiny enterprises are also part of the implementation process. The Technology and Finance Standing Committee (TFSC) constituted by the Ministry of Environment and Forests to review the proposals and projects prepared by various implementing agencies to phase out ODS technology and replace it by non-ODS technology with funding from Montreal Protocol Multilateral Fund. This committee also reviews the other financial incentives schemes like duty exemptions for import of equipments needed for non-ODS technology. It is a broad based committee with inputs from Ministries of Finance, Economic Affairs, Petrochemicals, Industry, Defense, CII and others with appropriate techno-economical expertise. Project Management Unit (PMU) is a society registered under the Societies Registration Act, 1860 for implementing ODS production and consumption phaseout projects in India. Chlorofluorocarbons (CFC) production sector phaseout project and CTC production and consumption phaseout projects are being implemented by the PMU. The PMU is governed by a Governing Body headed by the Additional Secretary MOEF and is under the administrative control of the Ozone Cell. The Central Pollution Control Board (CPCB) is empowered by the Ministry of Environment & Forests to implement regulation relating to controlling and monitoring production and consumption of Ozone Depleting Substances. The CPCB delegated authority to the State Pollution Control Boards for enforcement. The office of the Development Commissioner of Small Scale Industries, Small Industries Services Institute (SISI) at State level coordinate registration firms using ODS. Entrusted with monitoring progress of ODS phase out. Concrete measures to help reduce ozone layer depletion would include reduction in the use of Fossil Fuel. The use of fossil fuels has to be cut down to help to reduce the emission of green house gases. Shift to Renewable Resources means Switching from coal to renewable resources like solar energy and wind energy can be an option to reduce the use of coal and other fossil fuels which contribute greenhouse gases. Energy Efficiency has to be achieved. World Energy Consumption is rising by 2 percent per year. Energy use in developed countries could be cut by about 50 percent by increasing efficiency and practicing conservation. Stopping deforestation and undertaking mass plantation activities is also required. Over 23 percent of manmade carbon dioxide is caused by cutting of trees. Large Scale afforestation and better management of trees will help reduce the concentration of greenhouse gases in the atmosphere. Solutions can be found only through discussions and negotiations among the world nations. There needs to be collaboration in recognizing economic relationships between nations to create a sustainable and equitable global economy. The Developed and Developing countries need to join hands and have a common responsibility in dealing with problems arising from climate change and depletion of ozone layer. One such international effort is the Kyoto Protocol, an international treaty adopted to achieve the objective of Climate Change Convention, which is to stabiles the Green House Gas emission. Indian Green Building Council (IGBC) of CII with the support of all the stakeholders is spearheading the Green Building movement in the country. The movement was triggered off when CII-Sohrabji Godrej Green Business Centre building in Hyderabad was awarded with the first and the prestigious Platinum rated green building rating in India. Since then, Green Building movement in India has gained tremendous impetus over the years. Today, India has over 2,110 registered green building projects amounting to over 1.51 Billion sq.ft of green building footprint, which has put India on the top 5 countries in world green building map. Mr Gurmit Singh Arora, Vice Chairman � CII - IGBC Mumbai Chapter underlined that, today Mumbai with over 295 registered green building projects, amounting to over 229 Million sq. ft is leading the green building movement in the country. As this numbers steadily grow, the State can reap significant ecological and economic benefits. Most importantly buildings can demonstrate energy savings to the tune of 40-50 % and water savings to the tune of 20-30% , apart from other intangible benefits highlighted, Mr Arora. Mr Gurmit Singh Arora, while heartily appreciating and thanking the Hon�ble Chief Minister for his commitment to promote green buildings in the State informed that Environment Guidelines for Public Buildings will be soon released as Phase I and later same guidelines will be released for Private buildings as Phase II. This would add great impetus to the wider promotion of green concepts in the State, added, Mr Arora. In days to come, IGBC- Mumbai Chapter would work more closely with the stakeholders in organizing various programmes including the launch of IGBC Student Chapters, celebrating World Green Building Week Celebrations, facilitate increased participation from Mumbai to Green Building Congress 2013, Asia�s largest Green Building Conference & Exhibition to be held on 24-26 October in Chennai. Mr V Suresh, Chairman, IGBC Policy & Advocacy Committee And Principal Executive Officer � HIRCO, highlighted how IGBC is working closely with various Central and State Governments in promoting the wider adoption of green buildings across the country. As a result of concerted efforts, today Ministry of Environment and Forests, Government of India accords faster clearances for green buildings rated by IGBC. NOIDA Government also provides higher FAR (5%) to green building projects, he informed. IGBC also contributed in developing an addendum to the National Building Code of India which would ensure that all new buildings would be constructed according to green building norms, he added. Mr S Raghupathy, Executive Director & Head, CII & Green Business Centre (GBC) underlined that IGBC has successfully demonstrated excellent business case for green buildings. Today constructing green buildings are technically feasible and economically viable, he noted. The construction costs of a green building would be 3-4 % higher for a Platinum building than a conventional building, the incremental cost gets paid back within 3-4 years with substantial reduction in operational costs, affirmed Mr Raghupathy. Since 75% of the buildings that would exist in 2030 are yet to be built, there exists huge opportunities in design and construction of green buildings. Going green not only address ecological issues and concerns but also makes good business sense, concluded, Mr Raghupathy. Albert Arnold "Al" Gore, Jr. (born March 31, 1948) served as the 45th Vice President of the United States (1993–2001), under President Bill Clinton. He was the Democratic Party's nominee for President and won the popular vote in the 2000 U.S. presidential election. Gore is currently an author and environmental activist. He has founded a number of non-profit organizations, including the Alliance for Climate Protection, and has received a Nobel Peace Prize for his work in climate change activism. Gore was previously an elected official for 24 years, representing Tennessee in the U.S. House of Representatives (1977–85), and later in the U.S. Senate (1985–93), and finally becoming Vice President in 1993. In the 2000 presidential election, Gore won the popular vote by a margin of more than 500,000 votes. However, he ultimately lost the Electoral College to Republican George W. Bush when the U.S. Supreme Court settled the legal controversy over the Florida vote recount by ruling 5-4 in favor of Bush. It was the only time in history that the Supreme Court has determined the outcome of a presidential election. Gore is the founder and current chair of the Alliance for Climate Protection, the co-founder and chair of Generation Investment Management, the co-founder and chair of Current TV, a member of the Board of Directors of Apple Inc., and a senior adviser to Google. Gore is also a partner in the venture capital firm, Kleiner Perkins Caufield & Byers, heading its climate change solutions group. He has served as a visiting professor at Middle Tennessee State University, Columbia University Graduate School of Journalism, Fisk University, and the University of California, Los Angel He is also a member of the Board of Directors of World Resources Institute. Forest Department gets e-governed champion award for information management system. Madhya Pradesh Forest Department has been selected for e-governed champion award for the year 2009 by computer and IT sector magazine Dataquest for best utilisation of information technology for protecting forests. The award will be given during a programme in connection with national e-governed, which is going to be held from January 16 to 18 at Kochin. Minister of State (Independent charge) for Forests Rajendra Shukla informed that under the guidance of Chief Minister Shivraj Singh Chouhan, the system for conservation and augmentation of forests is being made more modern and effective. This national level award is being given to the Forest Department for evolving fire information system, forest crime management system and wildlife management system for implementing these programmes in an effective way. It may be mentioned that Madhya Pradesh Forest Department has developed its own database to which all the 460 regional and wildlife branches have been connected. As many as 52 centres have been established in remote areas of the state using EDUSAT system of ISRO for imparting training to over 20 thousand officers and employees through information technology. Through this centre 3000 trainees can be imparted training simultaneously. The Forest Department has almost completed digitasation work of total geographical area. Write & Win : My Ideas for better Environment .